A new beginning... I've always lusted after a modern do it all bike. It seems to be quite popular now with larger manufacturers and probably more in tune with the type of riding most people do. Like I've said in the past, the randonneur style bike; basically a bike that's somewhere between a touring bike and a road bike suits most enthusiast recreation cyclists, which is probably 99% of the market buying sport bikes. I've planned and picked components and they've all slowly come together, over the next few weeks I'll go through different aspects of the build and document and detail what, how and why I built it the way I did. Firstly I'll start with the thing that holds everything together, the frame. The requirements of the frame is that it will take disc brakes (preferably inboard mounted on the rear), reasonably wide tyres, a rack and mudguards. I'm not too fussed about frame material, although as you might guess I do have a soft spot for steel bikes. Weight isn't a huge issue as you could guess for me, within reason of course. It came down to two frames, the Decade Tripster or the Genesis Croix de Fer which are both quite similar. 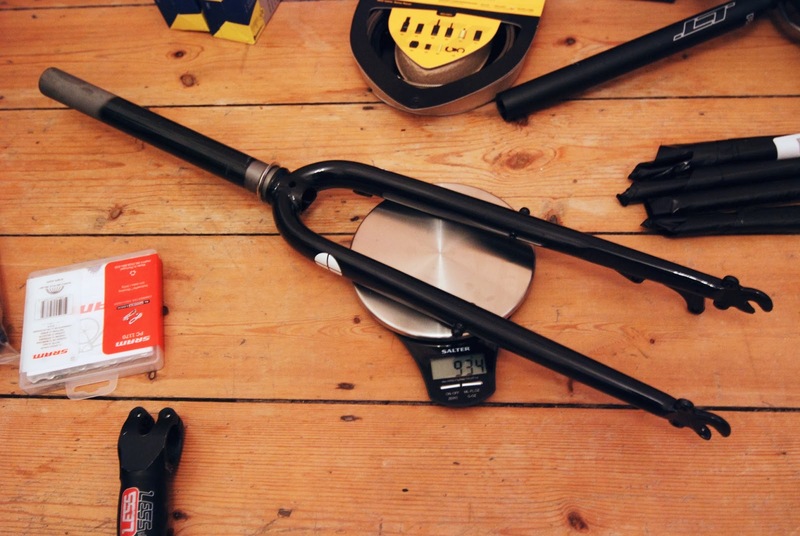 The main difference being that the Tripster is alloy, has a carbon fork and an integrated headset. 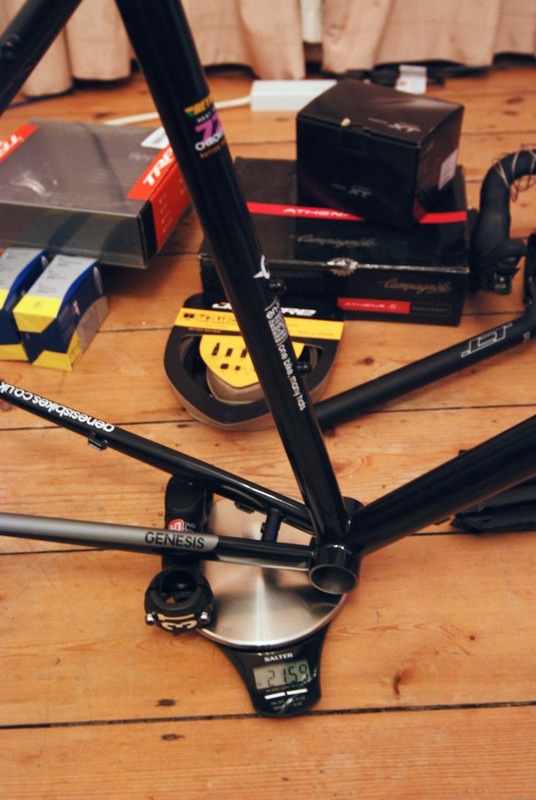 The Croix de Fer is Reynolds 725 steel tubing and a conventional external 1 1/8" threadless headset fitting. I love steel bikes and I don't particularly like integrated headsets, also the Croix de Fer forks have lowrider mounts if I ever want to mount a front rack for touring. The claimed weight difference was minimal, only 100-200g at most. 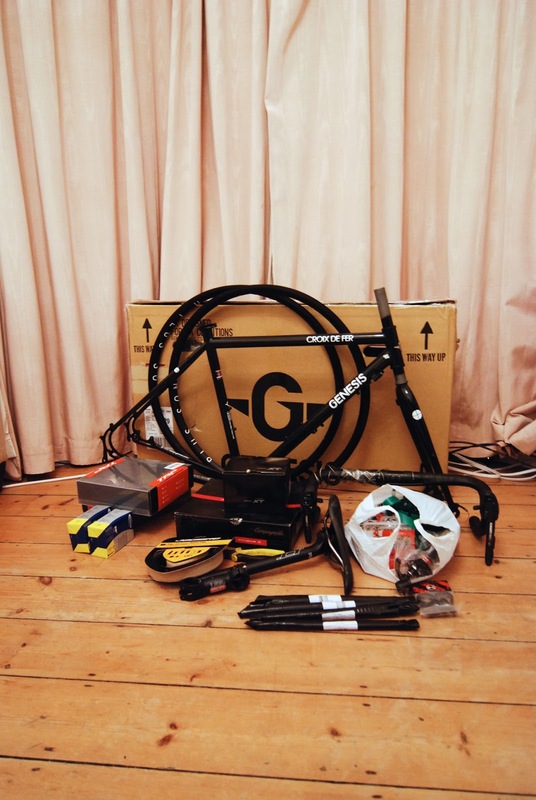 As you can tell by the pic, you can see what I went for in the end, also the Croix de Fer frameset was about £100 cheaper although it doesn't include a headset. The frame was a lot heavier than Genesis had claimed, the size I got was a 50cm model which is their smallest came in at 2159g bare frame, and if you were wondering, I tared the scale with the stem before weighing. This is significantly more than the 1980g claimed for the larger 54cm frame. The fork weight is more or less the weight claimed, only off by 4g. Generally the paint job on the frame is good, all the welds are decent looking as well, the frame colour itself isn't a pure black, it comes out as slightly lighter in bright light, barely noticeable but nice nonetheless. The new 2014 dropout design allows plenty of room for inboard mounting of disc brakes. The frame in previous years mounted the rear disc caliper on top of the seatstays which complicates rack and mudguard mounting. There are nice little details, such as the cut slot in the seat tube where the clamp goes is facing forward to stop mud from getting flung onto it by the back tyre I guess? Also on the underside of the downtube there are threaded holes presumably for fitting hydraulic hose clamps for disc brakes. Installation of the frame components went on without a hitch, the shop I bought the frame from did some frame prep on it, the BB shell appeared to have been faced and the Campagnolo BB cups went in nicely with a bit of loctite. The headset I chose was an FSA Orbit XL II which has a pair of angular contact cartridge bearings. The installation was a bit trickier, I had bought a cheap eBay headset press made from some threaded rod and plastic washer. The headtube ID was 33.8mm which is acceptable but on the tight side, the headset cups were 34.0mm which is what they should be. I did get the cups to seat properly after a little bit of effort. - It's nigh impossible to find a Campagnolo front derailleur with a 28.6mm clamp-on fitting, so I had to use a 28.6mm braze-on adaptor with a braze-on front derailleur. - The Croix de Fer, being designed for disc brakes only runs a full length housing to the rear brake down the downtube. I mistakenly ordered a cable set for a normal road bike which is a lot shorter. It's difficult to get true compressionless brake housing on it's own so I had to re-order the same thing in the XL size. So far so good, the frame has come together quite quickly with no real major problems other than ordering the cable set too short, however this was unforseen at the time of ordering. Next part is the wheels... Thanks for reading. Thanks for the detailed writeup, I'm building up a very similar shopping list by the looks. Maybe you can help me with the size of a 2014 Croix de Fer, my height is 1,69m and my legs 75 cm. You have a 50 cm frame, ¿do you suggest 50 or 52 cm frame for me? I'm slightly taller than you with a slightly longer inseam (I measure with my cycling shoes on), so I'd probably go with the 50cm frame if I were you. Be aware thought that a lot of this comes down to personal preference. Hope you enjoy it!